Interested in auto pay for your bill? Contact us to get set up. These internet pages are for informational purposes only. For a current quote, please call the office. If you wish to do transactions with Midland Marketing by Internet/Email, you must receive a confirmation from Midland Marketing, stating that they have received your Email. If you do not receive a confirmation, the transactions are null and void. Live cattle futures were down 80 cents to $1.10 on Monday, with front month April down a tick. This was fallout from the Cattle on Feed report. Soybean futures saw 3 1/2 to 4 cent losses in the front months on Monday. Meal futures were down 70 cents/ton, with May soy oil 10 points lower. 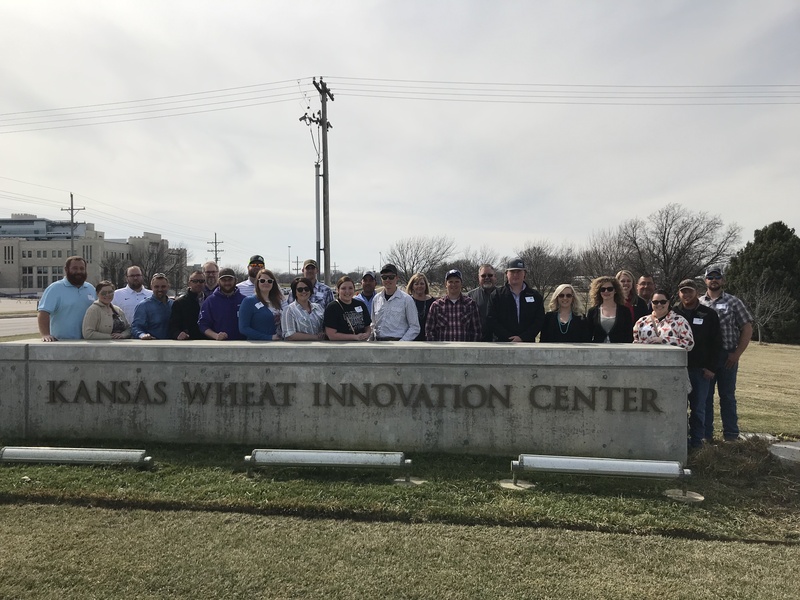 On March 22, 2019 several Midland Marketing employees and producers traveled to Manhattan Kansas for a two day Young Producer program and learning opportunity. Our producers took part in a new program being built around the next generation of members of our cooperative. While there the attendees had the opportunity to listen to various speakers on a variety of topics. Travis Brunner discussed with the group the Marketing Advisory Program about grain marketing. Next up, was Dr. Mykel Taylor from Kansas State University. Dr. Taylor gave a presentation on Rural Land Values and Rental agreements. This is very important for those producers just coming back to the farm or starting out with a farming operation. Over lunch the group had the opportunity to listen to Farmer/Rancher Jerry McReynolds from Rooks County and former Midland Marketing board member. Jerry spoke about the changes that Midland Marketing has gone through over the years and encouraged everyone to get involved in organizations. He also encouraged us all to be sure to share our stories about our farms and what we do each day. No one is a bigger advocate for what we do each day than ourselves. After lunch, Ron Treywn discussed National Bio and Agro-defense Facility (NBAF) and what it will bring to not only Manhattan and K-State but also to Kansas agriculture. We then headed to the K-State campus, to tour the Wheat Innovation Lab and Bio Security Research Institute. When our tour of these facilities ended, we went back to the hotel to get ready for supper and networking. Saturday morning the group was back up for breakfast and discussion on the prior day’s activities. Coop 101 was next on the agenda and we welcomed Brandi Miller from the Kansas Cooperative Council. Brandi spent the morning discussing cooperatives and their functions throughout the state. The group had the opportunity to discuss what Midland Marketing does in the communities they serve. The group took time to ask questions and discussed in length those questions or concerns with their peers. Overall those that attended the weekend event came away with the feeling that it was good and educational and a lot of networking available for years to come. The Midland Marketing Fuels Sales department offers a text message market update for our interested customers. We typically send the text updates before 10:00 am. If you would like to receive a market update over your cell phone, please respond back with your cell phone number. Please call with any questions. As of August 1, 2017 storage rates at Midland Marketing are .00167 per bushel/day in order to match the rates we are paying for terminal storage. All grains in storage prior to August 1, 2017 will keep the previous rate for a period of one year.